Special Occasion or Holiday Celebration! 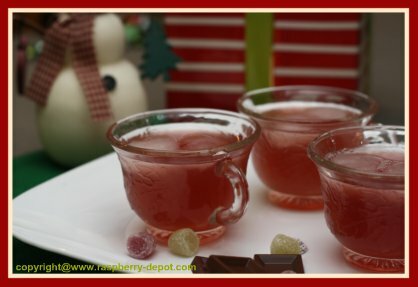 Raspberry Punch Recipes create pretty pink drinks suitable for weddings, wedding showers, bridal showers, anniversaries, Christmas, Thanksgiving, and any other Special Occasion or Holiday Celebration Party! The word "punch" refers to drinks, both non-alcoholic and alcoholic, generally containing fruit or fruit juice. Some punch drinks also contain ice cream, sherbet or other additives. This social drink originated in the early seventeenth century to England from India. Its popularity spread from there to many other countries, and it is now used almost everywhere in the world. Have a look at the links (below) to my favourite punch recipes with raspberry fruit. There are a great variation of recipes, some including sherbet, other types of fruit such as strawberries, and even the option of making an alcoholic punch recipe for adults. Scroll down further for a Pretty Pink Raspberry Drink that is both easy to make and has great, refreshing flavour! In a punch bowl, dissolve the sugar in the water. Add the juices and the lemonade and mix well. Stir the ginger-ale into the above mixture. Top with ice mold if desired. **To make decorative ice mold, arrange edible, chemical free flowers or raspberries, in a heart or ring mold. Add water to half fill mold. Freeze till water is firm but not totally frozen. Add enough water to fill ring (and totally cover the flowers). Freeze till ready to use. Punch is typically served at parties, and other festive occasions in large, wide bowls, known as punch bowls, or from large urns with a spout for easy dispensing. I especially like the punch dispensers which are now quite readily available. They are much more efficient than the punch bowl and ladle sets, and they create far less mess than the bowl and cup punch sets. Click on the images for additional product information and customer product reviews.